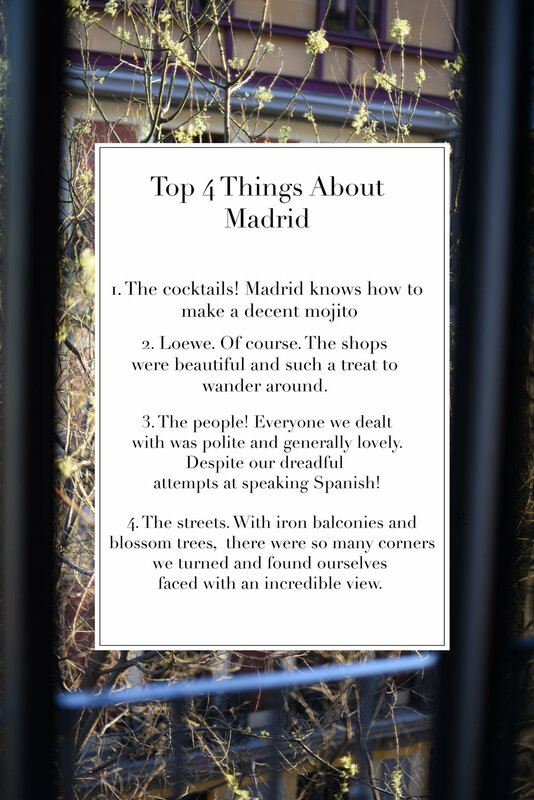 So last weekend Harry and I spent a few days in Madrid. It was the first time either of us had visited the city, and it completely surpassed our expectations. It is right up there in my top five cities ever. It was beautiful, manageable to walk around and navigate, and full of different areas to explore. So I have put together everything we got up to in one post here; from where we stayed, the areas we loved, the meals we had and the best shopping spots. We explored the city solely on foot, which meant we really did get the lay of the land and a different feel for each area. Salamanca was the posh bit with the fancy shops. Malasaña was the edgy, cool bit that felt full of locals. These were the two spots we went back to the most, they were completely different from one another too! There were some roads we found ourselves on that aren't necessarily worth the visit; Gran Via is like Oxford Street in London, heaving and full of shops you see at home too. Peurto del Sol was filled with people dressed up in costumes and tour groups, and generally was a 'lets get through here as quick as possible' area. There are beautiful streets and squares throughout the city, and you can walk from Retiro with the park and Prado Museum, across to Salamanca and through to Malasaña all in one day. Granted, it's a lot of walking, but it's well worth it. We stayed in the Totem hotel, in the Salamanca area. It’s the super posh area, leaving us dangerously close to all the high end boutiques and Spanish department store Il Corte Ingles (Where I did some damage). Aside from your bank card being at risk to a bit of abuse, the area is amazing. Incredibly clean streets (something Harry and I noticed about the city as a whole), and it never felt like it was super busy - even on a Saturday. You are in walking distance of everywhere, the only taxi’s we got were to and from the airport, everything else we did on foot. It’s also a quiet area on an evening, meaning you will be in for a good night’s sleep, something I find is often compromised while staying in city centre hotels. The hotel itself was gorgeous. We went for the bed and breakfast option as it’s always so much easier to start a busy day on a full tummy. The interiors of the hotel were stunning, The most incredible wooden staircase was perhaps my favourite bit, and serves as a decent leg work out if you fancy giving the lift a miss! On the first night we headed straight to the bar, and they were the best cocktails we had while we were in Madrid. The staff were amazing, all fluent in English (a godsend for us who know little to no Spanish), and most importantly know how to make a decent mojito. It’s also a great bar if you are after somewhere you can actually hear each other to chat, making the whole experience all the more relaxing in my opinion. The rooms were lovely too. With double doors out onto a juliette balcony, and huge bed, and stunning marble monochrome bathroom (you can see that on the website here, as I didn’t manage to get a photo that did that bit justice!) All in all it was the perfect base for our stay. We dropped in during the day to drop off any shopping bags due to it’s location, made use of the bar every evening, and got a good night’s sleep every night too! I must thank you all for all your recommendations on this one. We have fallen foul to visiting a city underprepared before, and spending too much time aimlessly wandering on sore feet before making do with a mediocre restaurant because you don’t know where else to go! We had a few places under our belt, and struck gold on the off chance too. The first spot was Amargo The Place To Be in Malasaña. We stopped by here for a late lunch and it was delicious. It was a two course menu for just €13.90; a fruit and veg (which was way nicer than it sounds) to start, followed by a hamburger. The interiors were super cool, and it was a very busy and popular spot. The food wasn’t spectacular, but we had no complaints, especially for the amazing price. We also managed to find a popular tapas spot in the area; Ochentagrados. Now this is by no means traditional tapas, and some of the dishes didn't go down too well with us. Think beef tartare with mustard ice cream, Sangria with lemon foam on the top. If you are a fussy eater then steer clear of this one, but if you fancy something a bit different then go for it. We mostly tried to have a big breakfast at the hotel in the morning, and a big mid afternoon meal so that we didn't really feel the need to go out for dinner. It meant we only had one evening meal the whole time we were there, which was a last minute find. A quick google search, and the criteria being that we did not want to walk very far, we wandered to Platea. It's a huge theatre converted into restaurants and bars over various floors. There is a large restaurant at the bottom, but we stuck to the middle floor, which operated more like a buffet. You find a seat (if you can), someone will take a drinks order (the cocktails were amazing), then you go up and wander round the different food counters and take your pick. It's lots of nibbly food, but there is huge choice and it was all delicious. There is a DJ playing so it's quite loud, and we were there on a Sunday night and it was still super busy, but it was such a good little find! One spot that had been recommended loads on my Instagram was Dray Martina. We booked in for lunch, although the brunch is meant to be the main event here. It was gorgeous inside, super light and fresh with stunning interiors. The food was the best we had while we were there too! We went for the Pad Thai Tacos, they were incredible! I could honestly have ordered everything on the menu, and had we been there for a little longer we would have gone back there for another meal - if that isn't the sign of a good place then I don't know what is! And finally, you must visit the Mercado San Miguel. This was on the top of Harry's list as he was on the hunt for some oysters as he had never had them before! They went down a treat with him too. It's not just seafood here though - there is fruit, olives, meats, sweet treats and incredible Sangria to be had. It's a lot smaller than I imagined, and is completely undercover. You don't need too much time in here, but I would recommend picking up little bits from as many of the stalls as you can. It's mostly bite sized food, you can really leave room to try lots of different things. We got there early on Sunday morning, and it was already getting busy, so do bare that in mind. I think heading here on a Saturday afternoon would be hellish! We didn’t do any museums or art galleries as we both decided we preferred the idea of wandering around the sunshine rather than inside. I felt like we literally covered every corner of the city, and really got a sense of it’s layout - we could get to everywhere we needed to go without a map by the last day! It definitely had us feeling a little bit like locals, and I highly recommend you experience the city in the same way. It’s full of beautiful streets, many characterised by dark iron balconies on the windows which we loved. Retiro Park is well worth a wander around too. It was pretty busy, so we spent a good half hour sat on a bench doing some people watching. We ended up stumbling across a nice spot for a coffee in an unexpected area too which is worth mentioning. Right on the Puerta de Alcalá, there was a café called Cappuccino that we dashed into because I was bursting for a wee. Because of where it was, I was not expecting much, I guess it would seem similar to choosing to have a coffee on the Champs-Élysées in Paris. But it was so good!! Honestly a really delicious coffee, and a nice busy spot to sit down and watch the buzz of the city, Don't go out of your way to go here or anything, but if you are in the area and bursting for a wee like me, then choose there! Hope you all find this helpful. If you want more recommendations then check out the comments section on this Instagram post too!